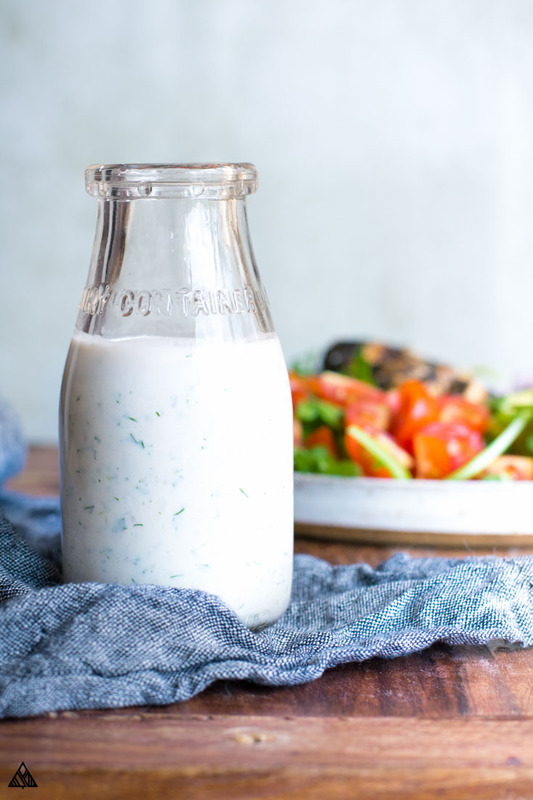 Keto Ranch Dressing — The Dressing You'll Want to Put on EVERYTHING! …because homemade is always better. And low carb does not mean low flavor. 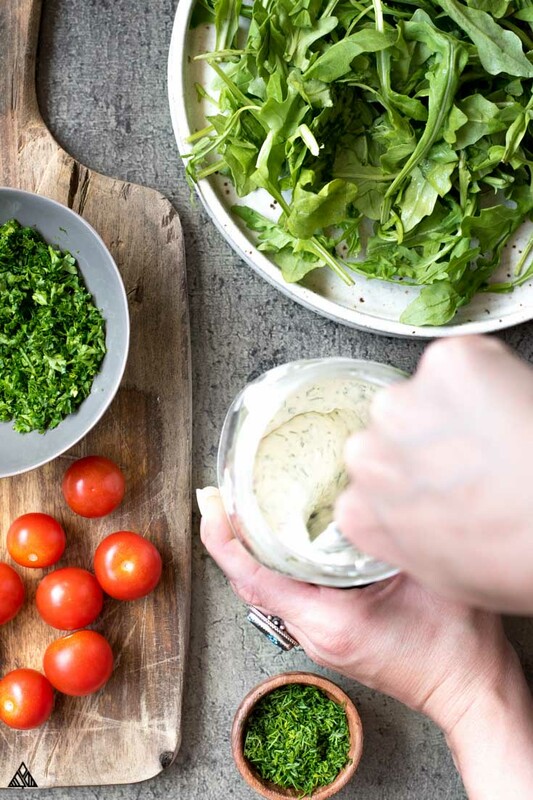 My friends, this keto ranch dressing is here to end that salad slump you’ve been living it. With a handful of variations and low carb recipes to pour this over, you’ll never get tired of it. 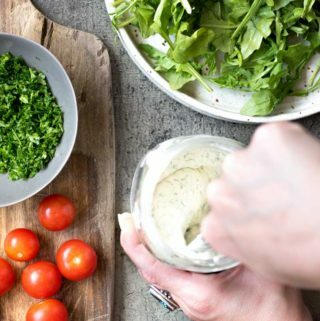 So, if you’ve got five minutes and a handful of low carb ingredients, then let’s make this keto ranch dressing! If you’re wondering about ranch dressing on keto diet, you may be surprised to find that a serving of store bought full fat, has .9 grams of carbs in ranch dressing, whereas fat free has 3.7 grams of carbs! I swapped buttermilk with heavy cream — which contains half the carbs, and 10 times the fat — perfect for keto ranch dressing! The list goes on! Everything tastes better in sauce, and everything tastes better in keto ranch dressing. Minced Jalapeno, Sriracha, or something to crank up the heat! Shallots — my personal favorite, I use a cheese grater, grate the shallots and add all the juice + the shavings. The world is your oyster! Add whatever spices your low carb meals require. I’ll also mention that I’ve made this with low carb Greek yogurt instead of mayonnaise several times — I much prefer the taste! That said, there are quite a few more carbs in low carb yogurt than mayo, so it depends on what works best for you are your low carb diet. The great news about homemade keto salad dressing is the number of delicious low carb shopping list ingredients you can use! Oils, heavy cream, sour cream, vinegars, lemon juice, lime juice, and soy sauce are all ingredients I’ve used as a base. Then, throw in a handful of flavor agents such as garlic, shallots, herbs, and spices, and you’ve got your very own keto salad dressing! As with most low carb recipes, I find homemade keto ranch dressing to be WAY tastier than store bought keto dressing — but if you’re in a pinch, there are plenty of keto ranch dressing brands to grab with very few ranch dressing carbs! In fact, there’s only 1 gram of carbs in hidden valley ranch packet keto friends! That said, I find hidden valley ranch keto dressing far less tasty than this keto ranch dressing! Alternative keto ranch dressing store bought options are this Fat + Happy keto salad dressing to buy— has anyone tried it yet (let me know in the comments!)? 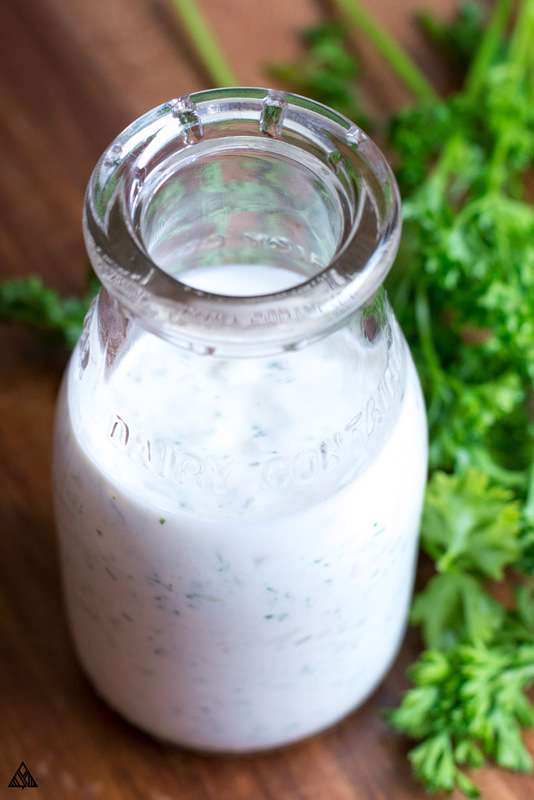 I can’t even wait to hear how you all use this keto ranch dressing! To dip? To top? To drink? (just kidding, don’t do that). 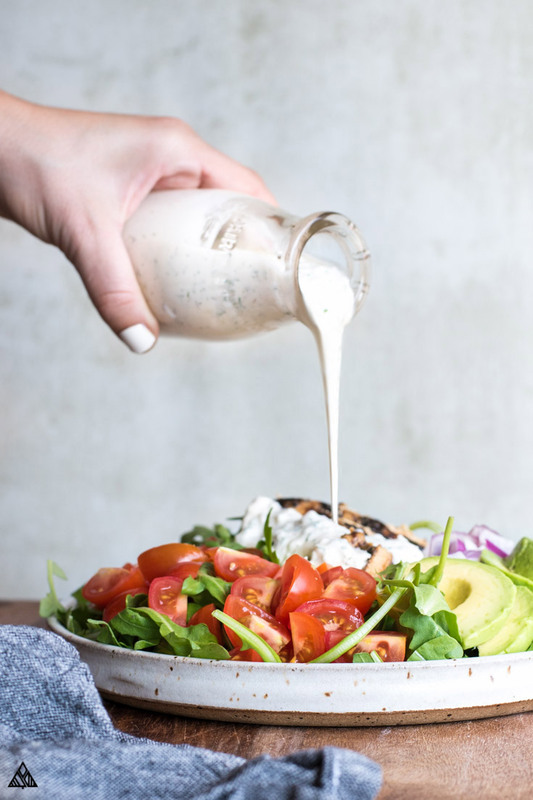 I hope you enjoy this keto ranch dressing as much as I do, and that it makes your keto salads tastier and more enjoyable! 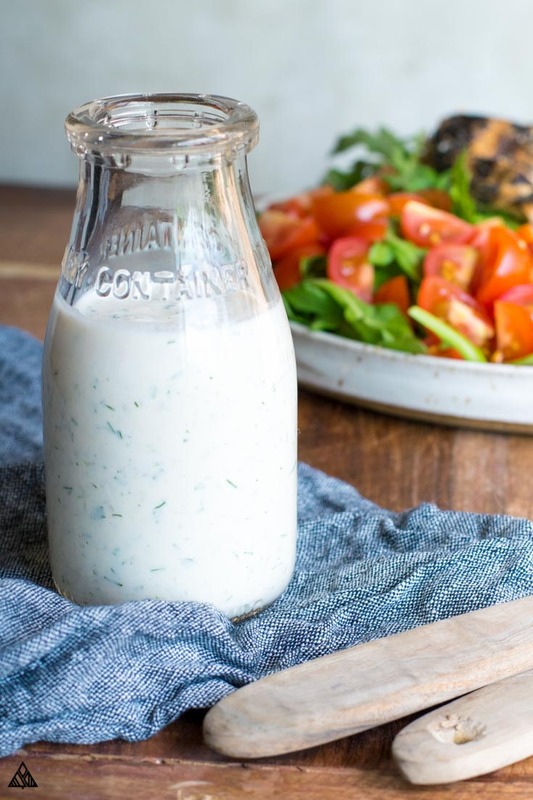 The question isn’t what will you eat with the keto ranch dressing recipe, it’s what will you NOT eat with it — This creamy, herby, fresh, easy and delicious homemade low carb dressing is here to end your salad slump! In a large bowl, whisk together all ingredients. Cover and refrigerate for 30 minutes before serving. Enjoy! Nutritional Information is for about 1 Tablespoon of keto ranch dressing. Dressing tastes best if the ingredients have time to marinate. « How Many Carbs in a Low Carb Diet? I can’t wait to try this out! It sounds amazing! Hi Diana! Oh, I hope your daughter feels better! Hmm I haven’t done much experimenting with this, but you could try a dairy free yogurt (like coconut or almond yogurt) instead of sour cream, and maybe full fat coconut milk instead of the cream? Both of this may change the flavor, and I haven’t tested either, but that would be the best dairy free swaps for this 🙂 Hope you guys enjoy! 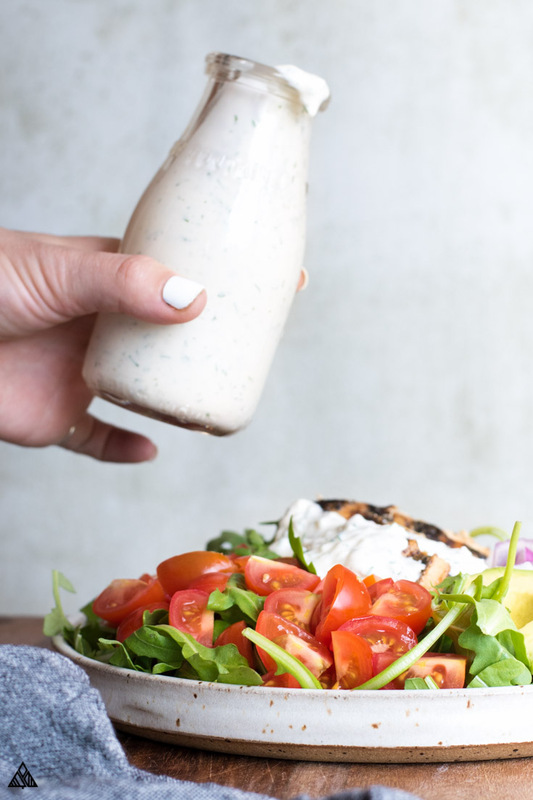 This looks delicious – I’m totally addicted to ranch dressing and need to try making my own. Could you please share the details on the adorable glass bottle you have it in? Thanks! Hi Sam! I got that from an antique store years ago, it’s an old mini milk jug! Hope you find something similar and enjoy the dressing!! How much is each serving? Hi Vivia! Each batch has 24 servings, which is around 1 Tablespoon. Hope you enjoy! How long is this good for? I’m the only one in my house that likes ranch! Crazy, right? How is that possible? Hehe, Since there are fresh herbs in it, I try to finish it up in 4 days, but I’m definitely over cautious with that stuff! Since it’s just you I’d make a smaller batch? Onion powder and garlic powder have carbs in them??? I didn’t see where the heavy cream is in the recipe? I’m looking forward to making this!! I am SUPER picky about Ranch dressing. I’ve made so many recipes and have never liked any of them. From top chefs to regular bloggers recipes. Most have too much of a lemon flavor or call for plain Greek yogurt. I tried to like ranch made with Greek yogurt and it is bland and has a weird taste and after taste to it. I’m not one to ‘play’ around with a recipe after I don’t like it to try to get it to my liking. I can’t stand to waste money like that. So I basically gave up. I’m not really sure why I decided to try this recipe. Maybe I wasn’t really ready to give up or maybe it was just fate but this is BY FAR THE BEST one I’ve ever made. The closest to the restaurants that have my favorite ranch. I can’t tell you how excited I am. I just want to make a BIG batch and hand it out to my friends and family who love ranch as well. The recipe calls for dry herbs. I used fresh parsley since I had it. I was a little afraid of using dried herbs especially chives but it works out great. Another difference is that I used Litehouse freeze dried garlic (granulated garlic) instead of garlic powder. I needed my garlic powder for a different recipe and only had enough for that recipe. THANK YOU from the bottom of my heart for this recipe. Seems to have the perfect amount of ingredients and the right measurements. I could kiss you. Sending you a virtual hug! Thank you, thank you, thank you! Well, yesterday, I made a batch and could not belive how delicious it is. It was so good that I shamefully helped myself to more than a tablespoon or 2. No danger of it going to waste here. I’ve tried other recipes, but yours, my friend, is the very best tasting, EVERRRR! My searching is over! Thank you so much!